A very important aspect of your physical health and wellbeing is balance. Needless to say this is key as we age and is especially important for seniors and the elderly. Yoga is certainly amongst the best systems for building and improving your balance, and in this article series I would like to detail 2 basic yoga poses which are excellent for this purpose. These 2 poses well also form the newest entries in our 2 popular online e-books, the Free Online Kundalini Yoga Poses E-book and the Free Hatha Yoga Poses. Also feel free to include them in your yoga sets using the guidelines laid out in the article, 6 Important Guidelines for Designing Kundalini Yoga Sets. The first pose I simply call, “Basic Yoga Pose for Balance”, and it is one that we frequently used in my Kundalini Yoga training to supplement the all important Spinal Warm-up Series. I have found in the yoga classes I teach, that students both old and young simply love this pose. It really makes you feel like you are doing yoga . A key aspect of this pose is the breathing and I will explain that further in the practice details below. The second basic and easy yoga pose which is excellent for developing balance is Tree Pose. There are a few variations to how this pose can be done, and my youngest and newest yoga student (my 4 year old son Shivum) will demonstrate this one for us in part 2 . I will cover the “Basic Yoga Pose for Balance” in part 1 here, and will cover “Tree Pose” details is part 2 tomorrow. 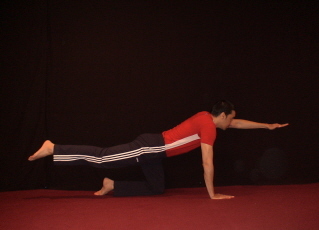 Come onto all fours, with hands directly under shoulders and knees directly under hips. Your eyes should be open for this pose. Keep your head up and find a point to focus on. Gaze steadily at this point as you practice this pose. This will help you keep your balance and also help you develop the power of concentration and mental focus. Extend your left arm straight out and your right leg straight back. Your fingers and toes should be extended and the arm and leg should be parallel to the ground. Look back and make sure your leg is straight and not angled up or down. Now begin Long Deep Breathing. As you inhale deeply, elongate your body, reaching forward with your arm, while at the same time reaching back with your leg. Feel yourself elongating from the hips. As you exhale “contract” back to normal. After half the time, switch your arm and leg, extending now the right arm and left leg back and repeating the exercise with the breathing as described above. 1 – 5 minutes / side. If 1 minute is too much you can start with 15 seconds and build up from there as well. Excellent for building physical balance and agility. Strengthens your arms, shoulders, hamstrings, hips and triceps. Builds mental focus and the power of concentration. Good for flexibility of the hips and spine. Not everyone finds this basic pose easy to do. So if it is giving you some difficulty that is perfectly normal in the beginning. Simply modify the posture by doing each arm first and then each leg, instead of extending your arm and leg at the same time. If the long deep breathing gets difficult for you to sustain, just do normal breathing instead. If you get tired, feel free to switch back and forth between either side and do shorter durations for each. Kundalini Yoga Spinal Warm-up Set (Feel free to add it to the beginning of this set).